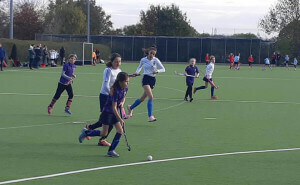 It was a very busy weekend for the Junior section, with the girls U12, boys U12 and boys U14 teams all in action for the first time this season in the Herts Junior League. Check out our tournament reports below. 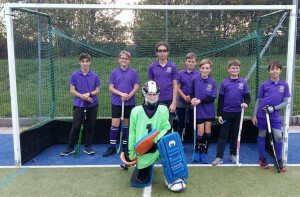 The under 12 girls had their first set of matches at Broxbourne – taking on Harpenden and Letchworth was sure to be a tough ask but our sensational six were up for a challenge! Difficult matches followed with both opposition teams able to field full line-ups, but this didn’t dampen our spirits. Molly and Izzy were our steadfast defenders, denying goal after goal. While the powerhouse in the middle was the dynamic duo of Mary and Harriet, and energetic Grace made sure there was always support across the pitch. Super striker Edie didn’t get much time in front of goal but kept running back in support whenever needed. A fantastic morning! Thank you to all the parents who stayed to support. The boys Under 12s headed out to Letchworth today for the Herts junior league with matches against Broxbourne, Blueharts and Royston. First up was Broxbourne, and our boys totally dominated the game with attack after attack, but with a string of fine saves the Broxbourne keeper managed to keep us out (rather like the men’s 2s match with them yesterday!!). The match ended 0-0, but what you would certainly call a winning draw! Next, we took on Blueharts Lions who proved a much tougher test, and in an end to end game, there were chances at both ends before Blueharts broke the deadlock with a well taken goal lifted into the net. But our boys fought right back and were inches from an equaliser when a shot beat the keeper and hit the post, leading to a goalmouth scramble which Blueharts somehow cleared. A 1-0 defeat, but lots of fine performances throughout the team. Finally, we came up against a strong Royston side who had won both previous matches without conceding a goal. Royston took the lead early on, but Winchmore battled back quickly, and smart play at the top of the D enabled Zafar to break through and score a well deserved equaliser. Royston then scored 2 more in quick succession. Now some teams would have been demoralised at this, but we pressed forward quickly looking for an immediate reply, and it was Zafar once again who cut through Royston and then out sprinted the defence to knock the ball over the line to make it 3-2. A nervy last 3 minutes for Royston as we looked for an equaliser, but their defence held out for the win. Fine performances across the whole team – solid defence from Joseph, Thomas and William, dynamic midfield play from Ben, Zakary and Arran, and Zafar and Liam always threatening in attack. Lots of great passing, tackling and we used the whole width of the pitch – the training is paying off! Well done everyone, and thanks to all the parents for their support. 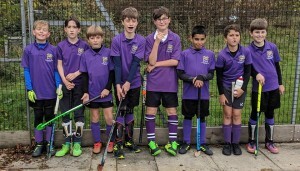 The under 14s boys team followed the under 12’s at Letchworth, with some of the more dedicated members having already trained earlier that day at Southbury. We started off well scoring against Hertford but were unlucky to go down 3-1 at full time. In the second game against Blueharts we were again unlucky not to score and showed great determination. The third game was against a Welwyn team made up mostly of Hertford players! (Welwyn had only managed to bring 2 players) needless to say our defence had lots to do. Letchworth were our next opposition with a striker who would not look out of place in our men’s first team! (for that matter could probably get served in a pub!) We battled well, with keeper John kept busy. Having played four matches in a row our team were due a break, however Welwyn were looking for players for their next match against Royston. Five of our boys took up the challenge and promptly scored 4 of the 5 goals in the 5-0 win! 2 for Tom, 1 for Ellis and 1 for Cameron. Spurred on by this victory we went on to win our final match against Royston, 1-0, with a great strike from Ellis. We have lots of positives to take from this tournament, we never let our heads drop and kept fighting right to the final whistle. Well done to Callum and Liam for their strong defence (Liam’s reverse stick goal line save had to been seen to be believed), Ellis and Theo working tirelessly in midfield, Tom and Noyan who never stopped running on the wings (Noyan -get some astros and you will be able to stop! ), Cameron up front and always looking for opportunities to score, finally John, solid in goal, producing some fantastic saves. Very proud of the team.